While I was chatting with my German friends on the Internet, we started discussing (what else?) music. One of them mentioned this phonostage that has been an underground favorite and selling like hotcakes in their country--the Entec Black Cube. Hmmm.... I thought for a moment and then asked "Hey, where can I get one?" The dudes parlayed out the the manufacturer's www site,and like a bat outta you-know-where I was, like, there. The Black Cube didn't look like much from the pictures: just a small black box with a few parts inside. Trusting my friends' judgment I said to myself, Oh, what the heck! It'd be good to try it just to see what all the hub-bub is about. An email message to Entec's owner, Norbert Lehmann, was in order. Within a few weeks, a box from Germany arrived at my door. Surely all we vinyl junkies have heard about the relatively inexpensive units from Audio Alchemy, Creek, and Rotel--among others. Many of these units have been here at one point in time. Well, it was time to see what all of my German friends were going bonkers over. Visually the Black Cube doesn't look like much more then two small boxes (114mm x 44mm x 108mm for the phono stage), although it's what's inside that counts: passive RIAA network, low-tolerance (5%) WIMA MKS caps, overkill outboard power supply, many power-regulation stages, including the use of fast diodes, double-sided circuit boards on both the power supply and the phono stage. All resistors are of the low-noise metal-film variety. MAN, the engineering looked very impressive. In fact, even the female RCAs on the unit are more impressive than those on units costing thousands of dollars. Fortunately, the Black Cube doesn't have a cheap and cheesy wall wart power supply; instead it uses a standard power cord that connects to a highly regulated high-quality outboard power supply. Then a two-meter cord attaches from the power supply to the phono stage itself. The owner's manual made sense, and it was much easier to adjust gain and loading with the Black Cube than with the Audio Alchemy unit: a simple flip of a dip-switch here, another one there, and I was ready to rock. Better still, there is an empty slot where you can add your own super-special resistor if you'd like. The low output impedance of <100 Ohms gave me the impression that this thing could drive even a passive preamp. Scratching my head, I began to wonder how Entec does all this for the small entrance fee. Hmmm.... Quite impressive for the chump change, although, as they say, "The proof is in the pudding." Norbert told me in his email that the unit takes about seven days from cold start to sound its best. Agreed, because it did take about a week before it seemed to settle in and started reaching optimum-performance level. There's no power switch, so the Black Cube is a simple connect-and-forget device (I like those). After about 10 days she really was, well... please read on. The current main setup here consists of a Voyd 'table with Audio Note silver-wired tonearm and step-up transformer. The Black Cube was out of place price-wise, but I hate changing my setup unless it is absolutely necessary (and besides, I'm lazy). Good news: no hum or buzzing! Some inexpensive units seem to have those gremlins to some degree. Being off to a good start, I grabbed my pressing of the Classic Records 12"-single reissue of Dusty Springfield's song titled "The Look of Love" (CR-5005-12). The first thing that caught my attention was how fast the Black Cube sounded. Notes came with the speed of a new Porsche and went without overhang. Some of the other inexpensive units I have heard seemed to diminish the natural attack of notes and voices. Springfield's voice was ever-so-naturally airy, though not bright. If you're familiar with this recording, any brightness will show up fast because of Springfield's SSSes as ssshe ssssings. One of the other slightly lower-priced phonostages here seemed so laid-back as to make music sound, well, boring. It may be that if your system is too bright to begin with, then this particular unit would help diminish it. But in a well-balanced system, this unit detracts from the music. Later in the Springfield song the saxophone comes in for a solo. It was, well, saxy! Hey, there's nothing like good sax early in the morning. Well, after some good sax it was time for some good harmonica. Yeah, the blues with tasty harmonica. That's the ticket! What yummy recording could I be referring to other than the 180-gram vinyl reissue of Sonny Boy Williamson's Keep it to Ourselves (Analogue Productions APB 036)? In my humble opinion, anyone who loves the blues really should have a copy of this. Good ol' Sunny Boy starts right out with some truly tasty licks. Most of us have been exposed to live harmonica and have possibly even played some ourselves. The harmonica is a simple instrument, though it is a great test of the inner resolution of one's music-reproduction system. As mentioned earlier, the speed of attack along with the ability of not holding on to a note too long aids in this resolution. 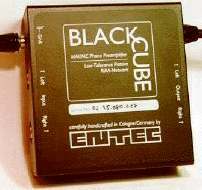 The Black Cube was the best of all the inexpensive units in this regard. The harmonica's reeds were well defined as were the inner-dynamics to a good degree. Again, I started scratching my head looking at this small black box delivering the goods like a four-figure tube or solid-state unit. Something magical was happening here, yet at this price? Naaaah, just can't be...or can it? So off to my friend's place and into a less-expensive Rega setup. Guess what? Same results. After a few of his favorite records were played he was also blown away. In fact, he wanted to buy it from me! So I said to him "NO WAY!!! Get your own! This toy is mine" (and like a five-year-old I taunted him by slowly saying "Naaaa, naaaa, naa-naaaaa, naaaaaaaa.") After all, it was my toy to review, and he'd have to wait until someone in the U.S. started distributing the unit (more on this later). Well, back at my pad I decided to remove the Audio Note IO/2 moving-coil cartridge in favor of the less-expensive and more appropriate price-wise Audio Note IQ/1 moving-magnet job--a very impressive cartridge for the money, by the way. All you Blue Point Special folks might want to try the upper-line Audio Note IQ/2. But that's another review, isn't it? Anyway, with the IQ/1, all the positive traits of the Black Cube were still there. Definition lacked a bit, but now we're also talking about the difference between an IO/2 MC/silver step-up combo at about $9k versus just a $200 MM cartridge. Still, the Black Cube with the IQ/1 was the best combination of a complete but inexpensive RIAA stage of all the units on hand here. Let's get back to the Sonny Boy Williamson, shall we? Side two, song one is "I Can't Understand." Dead-center voice, harmonica-blues--bombastic, fantastic. With the more appropriately priced IQ/1, the center-imaging was center, and I mean tight and dead center. I could easily hear all the fancy harmonica workings by good ol' Sonny Boy. Hmmm.... I know what'll trip up this unit. Yeah, let's make it show me if it can really handle the demanding stuff. So on the turntable went Pomp and Pipes (Reference Recordings RR-58). Here's some big orchestra and pipe-organ music (heh heh). Let's watch the Cube crumble, shall we? Going right for the jugular I decided to play Arthur Wills' "The Viking." Yes, this should be able to tell me quite a bit about the Black Cube. Just looking at the grooves on the record tells you quite a bit about this number. Towards the middle and also again near the end you see very widely spaced grooves. With proper mastering/cutting of the vinyl's stamper (good show, Reference Recordings), such groove patterns usually mean glorious, dynamic bass. (I laugh my sinister laugh.) It's torture time! Well, I did at least give my system a good chance by going back to my he-man cartridge/step-up setup (go ahead, try to say that five times fast). The soundscape was very well defined. During the middle of "The Viking" you can easily sense the different positioning of the French horns to the trumpets during their interplay. The snare drum was solidly placed towards the rear of the orchestra (and the snares of the drum were well defined) with the organ behind it. During the barrage of that big pipe organ, the sound of the horns wasn't obscured. WOW! Obviously the overkill regulated-yet-fast power supply aids greatly in achieving this. The bass was very deep yet defined. Actually it was better defined in some respects than with my expensive tube phonostage! Smaller dynamics and very-low-level (pp) effects were also well defined. Regardless of the dynamic level of the orchestra, the musicians never wandered. During the louder sections (ff to fff) this was also true. Now how can this be? And for only about $795 USD too? Where's the magic with this unit? There has to be something special here that's making this unit utterly magical for the money. Let me first admit my love for tubes. My current reference phonostage is a tube unit costing, er, um, well, thousands of dollars. Heck, my whole reference system is tubed. Now this little $795, small, solid-state, puny, plain-looking (when compared to all my other reference gear) phonostage comes along and delivers the goods. Maybe it's the power supply (possibly)? The attention to detail (perhaps)? The better-quality parts (good possibility)? System synergy (nope, tried it on multiple systems in many configurations)? Maybe because the Black Cube is inexpensive, fewer parts are used, which means less electronics to affect the signal negatively. Hmmm.... As a quick side note, I did listen to the out-of-print direct-to-disc Sheffield Drum Record (Lab 14). The Black Cube never seemed to be tripped up. The Entec Black Cube might not be the ultimate no-holds-barred phonostage, but for the money I've heard nothing that comes even close. This unit is very highly recommend. You don't owe it to yourself to try this unit. You owe it to the music. Postscript: During my auditioning of the Black Cube, a distributor came by my pad to pick up another unit I was reviewing for a printed magazine that I also write for (Ultimate Audio). He was so taken with the Black Cube that, well, let's just say he is voting with his dollars and is now the distributor! If he didn't step up and distribute this product, then only my German friends would be reading this review -- in the German magazine I've written for. Some distributors are truly looking out for their customers. 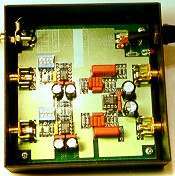 I have been developing high-end electronics for pro audio and consumer use for more than nine years now and for about two years I use the facility of my Internet account to make some contacts. I never got involved too deeply into this medium. I hardly surfed international hi-fi pages. However, I had nothing to lose. I personally assembled a Black Cube with a 120V power supply and sent the device across the Atlantic In the meantime I visited the SoundStage! website--and IMMEDIATELY realized what you are really doing! About six weeks later I got a telephone call from a really enthused Leo Massi, who now distributes the device and will exhibit at CES in January! This sounds too good to be true? To me it just reveals today´s possibilities of the Internet. I still wait for the great awakening here in Europe. It seems that only some people are really aware of the chances. So what about the review itself? This was the first time that the Black Cube has been connected to a chain of components, each of them on such a high level, auditioned by a competent reviewer who cares about the music. Steven´s review is highly valuable for me because he confirms my efforts in the direction of true sound reproduction. Being an audio engineer sometimes helps. It seems like Entec is going the right way. Thank you. My main attitude towards high-end hi-fi is that my devices have to be affordable! In fact, I develop only electronics that I would buy for myself in a hi-fi shop, having a real-world budget. If someone wants to spend more money on better and/or better-looking devices I don't mind. Thank you again and good luck for the future development of your magazine!